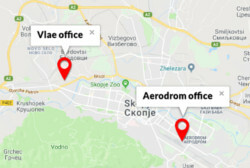 The most recent office is located at: 3ta Makedonska Brigada 48-a, Aerodrom. There is a room for 30 people divided over a few areas: ocean style office, spacious conference rooms and a relax corner. It is a good environment to enjoy your work and do some recreation in your spare time. The Vlae office is located at: Fjodor Dostojevski 72, Skopje. It is a modern, spacious and ocean style working environment. Quiet area, far enough from the crowd and traffic jam, but still close to the popular city places.